William Blake (1757–1827), Jacob's Ladder, or Jacob's Dream (1799-1806), pen and grey ink and watercolour on paper, 39.8 x 30.6 cm, The British Museum, London. Courtesy of and © Trustees of the British Museum. It’s often hard to see paintings in their historical context. What might appear to us to be a fairly mundane depiction of a particular motif could have been viewed very differently at the time that it was painted. 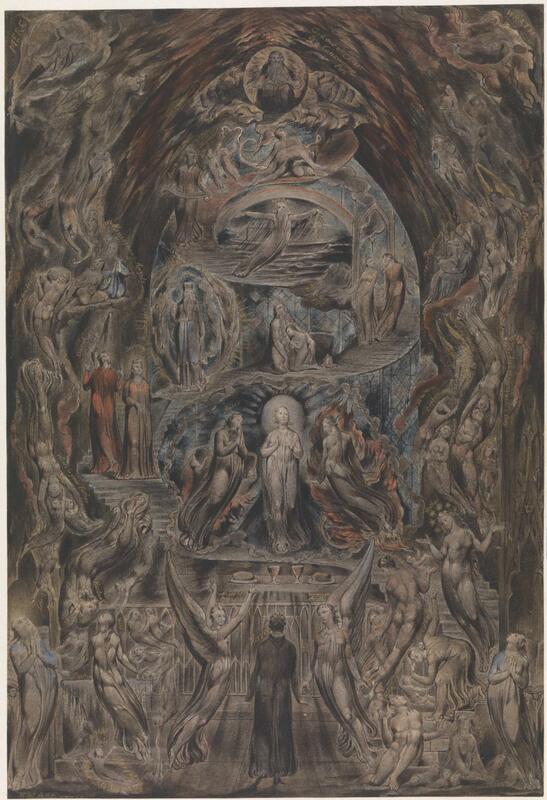 If I were to tell you that the watercolour below, by William Blake, was radically different when exhibited at the Royal Academy in 1808, and changed visual arts, and music, you’d wonder why. William Blake (1757–1827), Jacob’s Ladder, or Jacob’s Dream (1799-1806), pen and grey ink and watercolour on paper, 39.8 x 30.6 cm, The British Museum, London. Courtesy of and © Trustees of the British Museum. Blake’s painting of Jacob’s Ladder, or Jacob’s Dream (1799-1806) shows one of his many religious stories, that of Jacob’s Ladder, as told in the book of Genesis, chapter 28, verses 10-19. In essence, Jacob went to sleep one night when he was travelling, and dreamed that a ladder had been set up, stretching from earth to heaven. Angels were ascending and descending the ladder. God spoke to him in the dream, telling him that the land on which Jacob was sleeping would be given by God to Jacob and his descendants. Jacob then named the place Bethel, and in the future it did become a part of the land of the Israelites. It is one of the simplest and most beautiful of Blake’s very large output of watercolours, and was painted for his principal patron, Thomas Butts. Blake was sufficiently proud of it that it was exhibited at the Royal Academy in 1808, and the following year in Blake’s private solo exhibition at his brother’s house. The painting shows Jacob, asleep, at its foot. Right by his head is a spiral staircase which ascends to the top of the paper, thence we presume to heaven. Figures are ascending and descending the staircase: although some bear angel’s wings, many do not. The whole scene appears to be taking place inside some sort of ‘big top’ tent, with the starry sky of a moonlit night behind. There is no trace of any ladder in sight. To appreciate the significance of Blake’s use of a spiral staircase instead of a ladder, we need to consider the view of heaven in the Christian church at the time (and essentially since the foundation of the church). Heaven is ‘up there’ somewhere, well separated from the earth down here. Angels fly down from heaven on their wings, and those dead judged worthy of heaven are flown up by angels. The most pious, and key figures such as Jesus Christ and the major saints, may ascend to heaven in a more formal and significant process. But there is no two-way wingless route between earth and heaven. Salvator Rosa (1615–1673), Jacob’s Dream (c 1665), oil on canvas, dimensions and location not known. Wikimedia Commons. 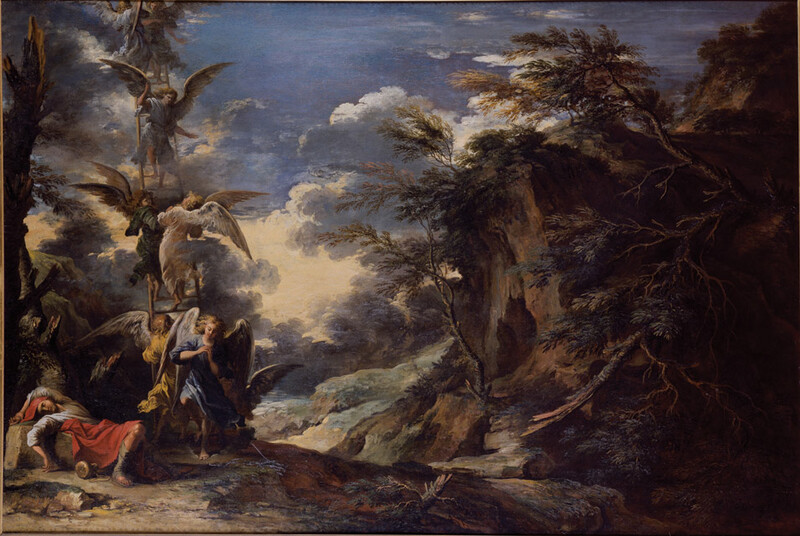 Traditional depictions of Jacob’s ladder, such as Salvator Rosa’s from about 1665, show a narrow ladder, with only angels ascending and descending. Because of the width of the ladder, it is hardly an easy route. Giorgio Vasari (1511–1574), Jacob’s Dream (1557-58), oil on panel, 224.6 x 237 cm, Walters Art Museum, Baltimore, MD. Wikimedia Commons. 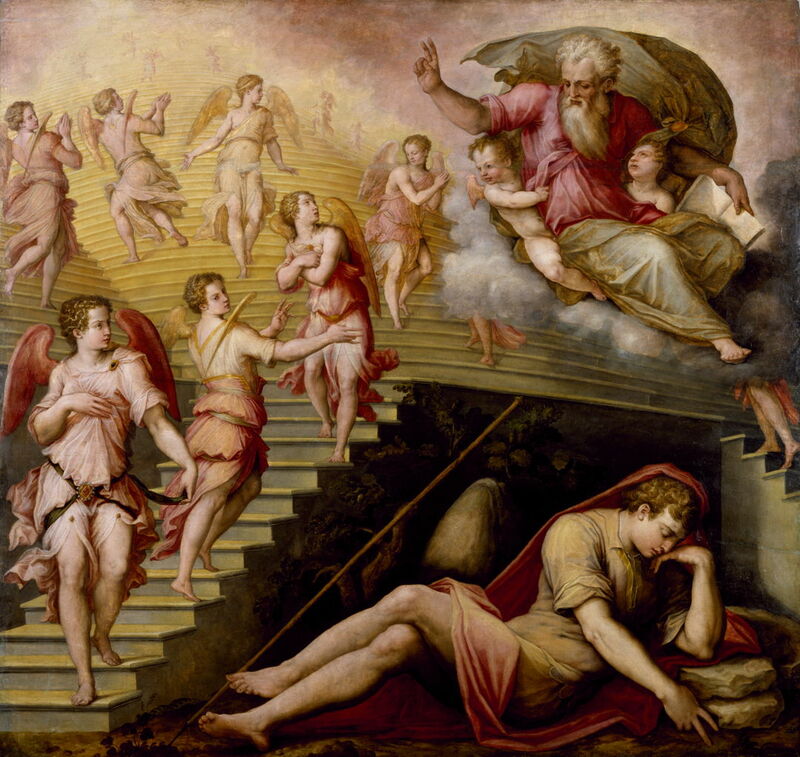 But in 1557-58, Vasari had painted a more radical interpretation of Jacob’s Dream, in which the ladder is replaced by a broad staircase. It is still only used by angels, and he shows God at its foot, presumably about to speak to Jacob. Francesco de’ Rossi (Salviati) (1510–1563), Bathsheba Goes to King David (1552-54), fresco, dimensions not known, Palazzo Sacchetti, Rome. Wikimedia Commons. Blunt proposed that Blake got the idea of using a staircase from Salviati’s fresco Bathsheba Goes to King David (1552-54), although he is at a loss to explain how Blake might reasonably have seen a copy of that fresco. It is also a rather strange choice of image, given that through the window at the top we are shown the naked King David and Bathsheba apparently making love. Rembrandt Harmenszoon van Rijn (1606–1669), Philosopher in Meditation (1632), oil on oak panel, 28 x 34 cm, Musée du Louvre, Paris. Wikimedia Commons. 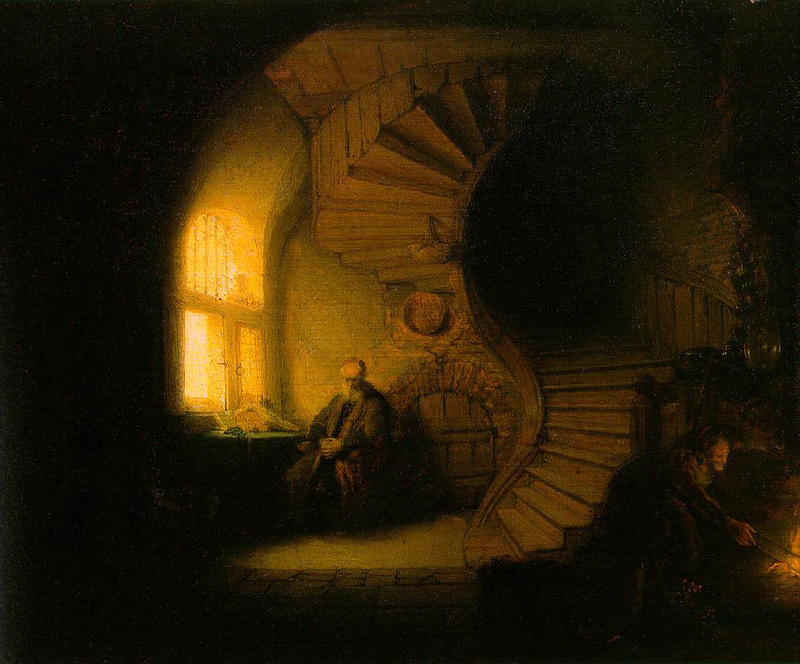 He also misses the point that Blake’s staircase is a beautiful spiral, more like that in Rembrandt’s Philosopher in Meditation (1632), or Koedijck’s Surgeon Tending a Peasant’s Foot (1649-50), below. But I have been unable to find any visual artist who has supplanted Jacob’s ladder with a spiral staircase prior to Blake in 1799-1806. 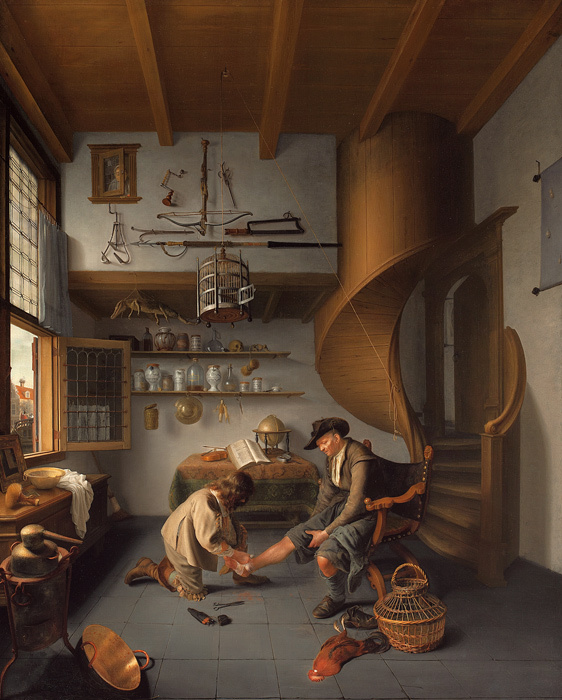 Isaac Koedijck (c 1617–1668), Surgeon Tending a Peasant’s Foot (1649-50), oil on panel, 91 x 72 cm, Private collection. Wikimedia Commons. Neither is this Blake’s only use of a staircase between earth and heaven, in its broadest sense. In about 1820-25, Blake painted a watercolour of his Epitome of James Hervey’s ‘Meditations among the Tombs’. 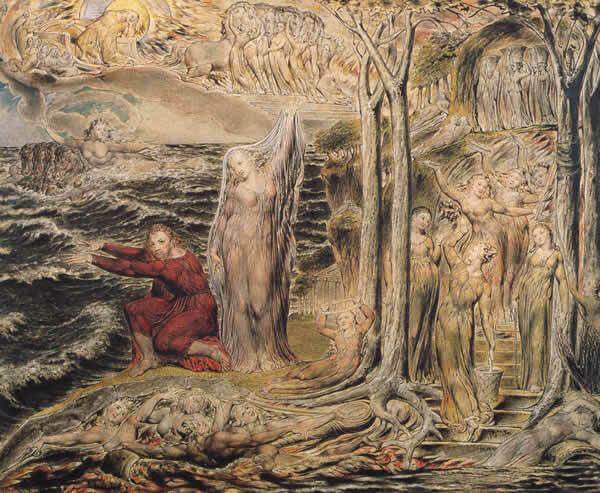 Hervey wrote devotional texts which Blake admired, and here the artist expresses his admiration, and sadness at Hervey’s early death, by presenting him at the foot of a curved (not spiral) staircase leading him up to heaven. Michelangelo di Lodovico Buonarroti Simoni (1475–1564), The Last Judgment (1536-41), fresco, 1,370 × 1,220 cm, Cappella Sistina, The Vatican. Wikimedia Commons. 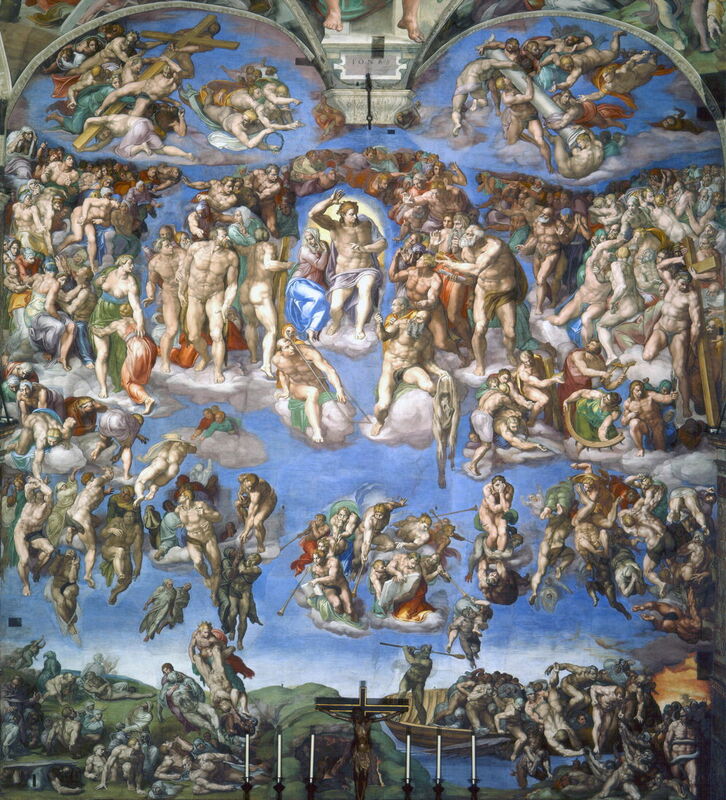 Blake’s major reference in that watercolour is of course to Michelangelo’s Last Judgement (1536-41) in the Sistine Chapel, in which there is neither staircase nor ladder to be seen. William Blake (1757–1827), The Sea of Time and Space (1821), pen, watercolour and gouache on gesso on paper, 40 x 49.5 cm, Arlington Court (National Trust), Devon, England. Image source not known. At about the same time, Blake painted his enigmatic The Sea of Time and Space (1821), in which a staircase rises from the women at the right, crosses the upper part of the paper, and meets the sun chariot at the top left. William Blake (1757–1827), Illustration to Dante’s “Divine Comedy”, ‘Paradiso’, Canto XIX (1824-27), graphite on paper, 51.8 x 36.1 cm, The British Museum, London. Courtesy of and © Trustees of the British Museum. When Blake died in 1827, he was working on his illustrations for Dante’s Divine Comedy, commissioned by the painter John Linnell. 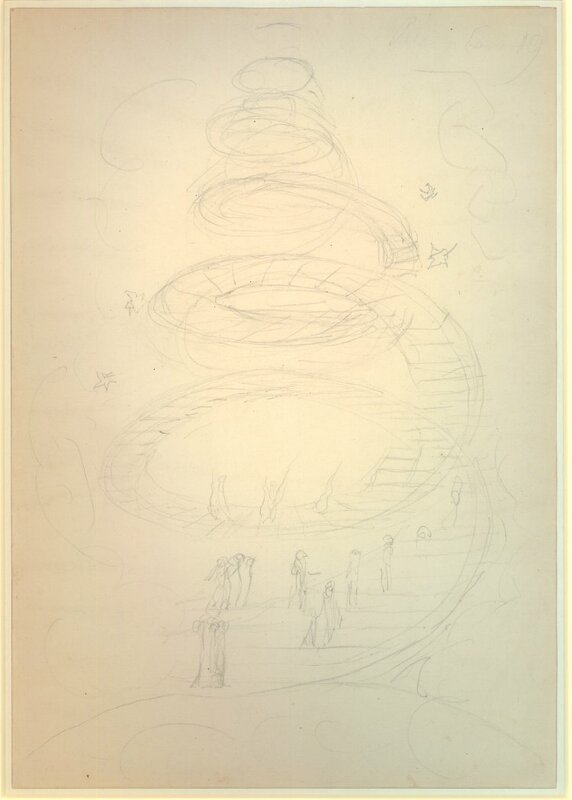 One of his last sketches, from 1824-27, shows another spiral staircase almost identical in form to that in his Jacob’s Ladder of 1799-1806. 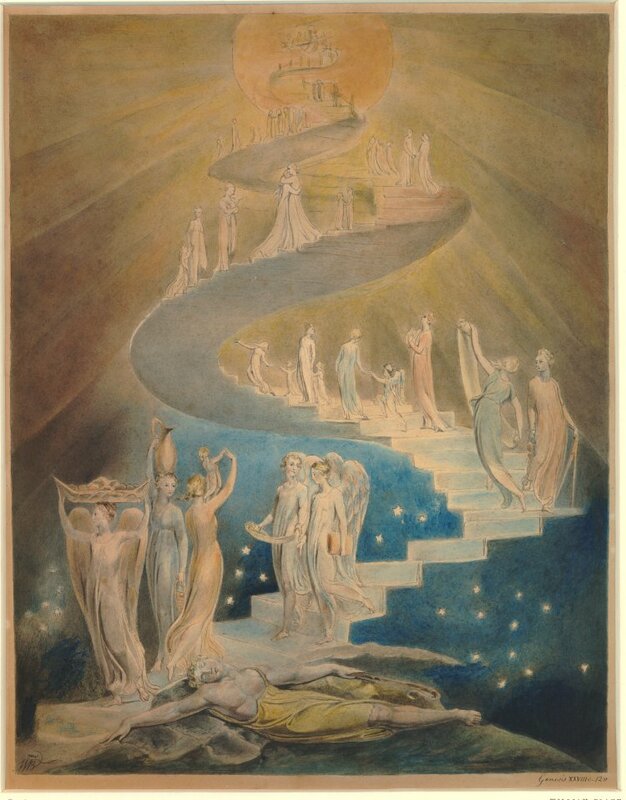 In the absence of any prior use of a spiral staircase in lieu of Jacob’s Ladder (or any other direct connection between heaven and earth), I believe that it was Blake who introduced this now general image to our visual tradition. It took a little while to catch on, but by 1880, it was sufficiently established for Sir Edward Burne-Jones to use in his The Golden Stairs. I wonder if any of this had occurred to the members of Led Zeppelin when they recorded the song Stairway to Heaven in 1971? Posted in General, Language, Painting and tagged Blake, Burne-Jones, de Rossi, Koedijck, Led Zeppelin, Michelangelo, painting, Rembrandt, Rosa, Salviati, Vasari. Bookmark the permalink.